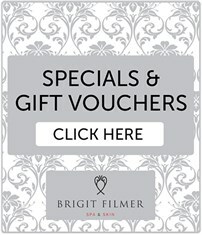 We believe that you should be rewarded for your loyalty to Brigit Filmer Skin & Spa, as our clients are our extended family and so we are proud to offer you our electronic loyalty programme. The electronic system, with no cost or obligation on your part, means no more cards to clutter up your wallet; all of the Spa Bucks earned with every visit are electronically tracked. > You earn Spa Bucks every time you visit us for a treatment. > One Spa Buck is earned for every R100.00 spent at Brigit Filmer on a treatment. > One Spa Buck is earned for every R200.00 spent at Brigit Filmer on home care products. > These Spa Bucks accumulate in your Spa Loyalty Account. > Check your balance during a visit to the spa or by phone. > Save up for a special treat as Spa Bucks can be redeemed at any point when purchasing a treatment with a value of over R250.00 - they cannot be redeemed for product or voucher purchases. They can also not be shared or distributed or redeemed for cash. > Brigit Filmer Spa & Skin has the right to modify or cancel points and/or the points system at any time. Have a look now at our range of superlative beauty and health therapies available. Download the pricelist.